The field proven TacticalPower line of AC and DC power conditioning products is ideally suited for applications requiring high-reliability, rugged construction, compact size and light weight design. The TacticalPower line is readily deployable worldwide. They are equally suited for use in airborne, vehicular, shipboard, field deployed or fixed locations with controlled or uncontrolled environments. Unlike other inverters that require you to mount the inverter and then bolt up a cable, the TacticalPower inverter systems can be quickly setup in the field without any tools. Using either the supplied cable or a standard NATO Slave cable, a quick connection can be made to the HMMWV DC power bringing AC online in less than 2 minutes. If the supplied cable is used, the NATO connector on the TacticalPower unit can be used as a DC power port for other devices using the NATO Slave cable. With typical inverters, you have only two (2) outlets, limiting the number of devices you can connect. Conversely, the TacticalPower basic output configuration provides four (4) outlets in the briefcase and universal mount versions or six (6) outlets in the transit case version, each widely spaced to allow for oversize plugs and transformer power supply modules. Most fielded inverters have internal cooling fans, but no air filters. This results in the internal components eventually overheating from dirt buildup on the internal components. On the contrary, the Tactical Inverter units are equipped with an intake air filter that is easily taken off to wash when needed, thus protecting the equipment from sand and dust contamination. With typical inverters, there is an input fuse buried inside the equipment chassis. This requires having to have spare fuses available and having to tear the unit apart to replace a blown fuse. 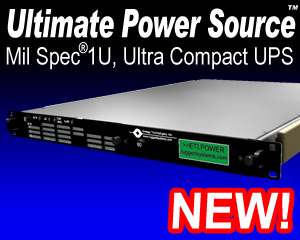 On the contrary, the TacticalPower units incorporate a double pole input DC circuit breaker. This eliminates the fuse issues while providing added personnel safety, equipment protection and ease of maintenance. Further, a Ground Fault Circuit Interrupter (GFCI) and safety ground connection provide added safety protection to personnel from grounding hazards. Overall, the Tactical Inverter line is uniquely qualified for reliable vehicle, airborne, shipboard or land based C4ISR operations combining advanced modular design features with highly reliable construction. For a list of comparison features, go to Inverter Notes. 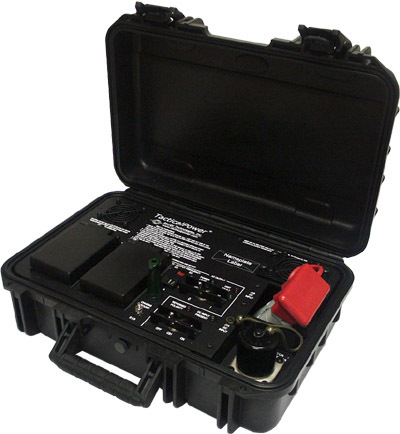 ETI's Tactical Inverters are built into heavy-duty briefcases or transit cases to occupy a minimum of space while protecting the equipment during transit or during field use. ETI's inverters are designed for use with vehicles and aircraft or any other equipment, with a 12, 24 or 48 VDC source. Multiple input and output connector options are available. The basic input configuration provides two quick connect devices, one being a NATO Slave connector identical to those found on military vehicles such as the HMMWV. Internally, all major components are well secured and electrically insulated to prevent damage due to shock and vibration. Rugged handles aid in lifting and latches secure the cover in place during transport. In the transit case version, the cover also holds the supplied input cable. The basic input configuration provides two quick connect devices, one being a NATO Slave connector identical to those found on military vehicles such as the HMMWV. Internally, all major components are well secured and electrically insulated to prevent damage due to shock and vibration. 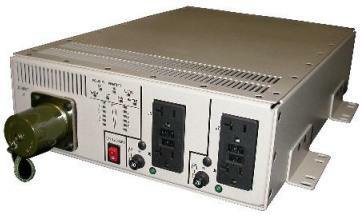 Inverters in this series also include an AC bypass feature, allowing alternate sources of AC to be connected through the unit allowing for easy maintenance, or other high level requirements. ETI manufactures inverters in numerous power ratings with 12, 24 or 48 volts DC input and output ratings from 100/110/120 or also 200/220/240 VAC. These units all come built into sturdy metal cases which can be attached to walls, floors, tables or any other fixed surface. 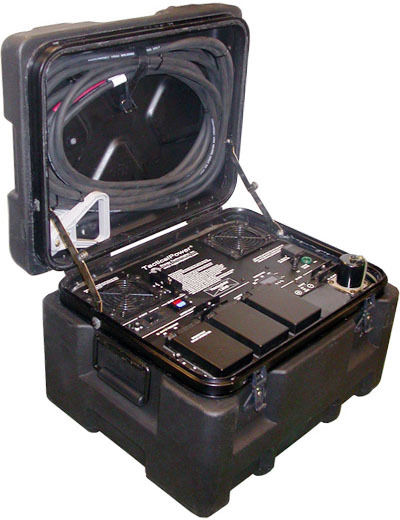 ETI's Rackmount Tactical Inverters are available in transportable tactical cases, server racks, or other configurations. They are available in numerous power ratings with 12, 24 or 48 volts DC input and output ratings from 100/110/120 or also 200/220/240 VAC.